The results from the Messenger spacecraft's third and final flyby of Mercury are finally in and cover ground never before mapped. But they leave scientists wanting more. NASA's orbiter swung around Mercury on Sept. 29, 2009 to get a gravitational boost before settling into orbit in March 2011. The snapshots it took as it flew past provide tantalizing glimpses of young volcanic vents, violent magnetic storms and mysterious concentrations of calcium in the atmosphere. But the view was cut short by the spacecraft going into safe mode just before its closest approach. Planetary scientists are now anxious for the main event. "It will be so great when we go into orbit," said planetary scientist Brett Denevi of Arizona State University, co-author of a new paper describing the new view of Mercury's surface. "This is all just a teeny snapshot. Going into orbit will be like two flybys every day." Three papers published online July 15 in Science Express describe what Messenger saw on its last flyby. Scientists have now mapped 98 percent of the planet by combining the new observations with the first two flybys in January and October 2008, plus the Mariner 10 mission in the '70s, Denevi said. The latest flyby filled in a 360-mile-wide gap that had never been imaged before. "It wasn't a huge amount of real estate, but there was a lot of really interesting stuff there," Denevi said. The most exciting features include a 180-mile-wide basin filled with hardened lava, and a crooked bowl surrounded by glass and magma that may be the largest volcanic vent ever identified on Mercury. 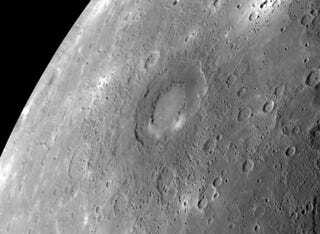 Together, these features suggest that Mercury had active volcanoes later in its history than scientists had suspected. "After Mariner 10, it was thought that if Mercury had volcanism at all, it probably shut off really early in the planet's history, earlier than the other planets," Denevi said. Earlier flybys showed this view to be totally wrong: 40 percent of Mercury's surface was formed by volcanoes, some of it recently. And the new basin, dubbed Rachmaninoff, shows that Mercury may have been volcanically active well into the second half of its life. The smooth plains that fill Rachmaninoff were likely once molten magma that welled up from below. Although Denevi says we can't be certain exactly how old the terrain is without analyzing samples, it could be less than a billion years old, "which is young on a planetary scale." To Rachmaninoff's north is an irregular depression surrounded by bright material that looks yellow in false color images (right). This feature was spotted from Earth-based telescopes, but had been labeled an impact crater. It wasn't until the third flyby that scientists recognized the bowl for what it is: a volcanic vent. That was surprising. Because Mercury is so close to the sun, scientists expected all the volatile gases that could burst out in explosive volcanism would have been driven off. But at least in this one spot, there were enough gases to drive fiery plumes of magma to the surface. There's still more to see of Mercury's surface, and better angles to see it from, Denevi said. "We'll have to wait until orbit to get a really good look." Another surprise came from Mercury's magnetosphere, the region above the planet's surface where the magnetic field butts against charged particles and plasma from the solar wind. Besides Earth, Mercury is the only terrestrial planet that has a magnetic field generated by a liquid core. Both planets' magnetospheres are deformed by the solar wind, leaving a bulge of magnetic field on the planet's sunward side and a long tail like a comet's extending away from the sun (below, left). On Earth, the solar wind sometimes breaks the lines of magnetic force on the sunward side and pulls them back into the tail, resulting in a massive buildup and subsequent dissipation of energy (below, center and right). This "loading" and "unloading" of the tail causes space weather disturbances called magnetic substorms, which last around an hour on Earth. The energy from these storms accelerates charged particles through the Earth's upper atmosphere, creates the Northern Lights and wreaks havoc on communications satellites. Mercury's weak magnetic field supports substorms, too - 10 times stronger and 20 times faster than Earth's. Messenger recorded four storms, each of which took only two or three minutes. On Earth, the amount of energy in the tail increases by only 10 or 20 percent, but on Mercury, the energy doubled or tripled. "The loading and unloading was extreme, it was huge," said NASA space physicist James A. Slavin, lead author of a paper describing the magnetic observations. But weirdly, despite the intensity of the substorms, Messenger didn't detect a single accelerated particle. "It's a conundrum," Slavin said. "For some reason in this little magnetosphere, none of that energy is making it into energetic particles." The only solution is to wait for more data. "We're really looking forward to the orbit phase," Slavin said. "It might be quite a treasure trove." The link between the surface and the magnetic field is Mercury's tenuous and changeable atmosphere, called the exosphere. Everything in the exosphere was knocked off the surface by ions, photons or dust. "You get definitive fingerprints of things coming off the surface," said planetary scientist Ron Vervack of Johns Hopkins' Applied Physics Lab, lead author of the paper that deals with the exosphere. "It gives the best picture of composition until we can have hard samples in the lab." And charged particles in the exosphere can be carried around and away from the planet by the magnetic field. "Our extreme tail loading may be important for maintaining Mercury's exosphere," Slavin said. The third flyby made the first detailed measurements of sodium, calcium and magnesium over Mercury's poles. Messenger also made the first measurement of an ion, positively charged calcium, in the exosphere. These measurements can help understand how materials move around the planet, Vervack said. The strangest thing found in the exosphere was a persistent smear of neutral calcium near the edge of night and day. This extra clump of calcium was in the same spot in all three flybys, which, in an ever-changing exosphere, is profoundly weird. "We don't understand where it's coming from, or why it's so consistent," Vervack said. Concentrations of magnesium and sodium both changed between the flybys, so some unknown surface process must work on calcium alone. Like the rest of the Messenger team, "we need more observations at this point," Vervack said. "It's a puzzle, but we don't have all the pieces yet."